Are you ready for a sweet giveaway? Monday I shared how I styled my Sweet Gigi New York iPhone wristlet and today I am sharing the opportunity for you to win one! Gigi New York has so generously agreed to give one lucky follower a wristlet of their own! Get excited peeps! This is awesome! This little gem is so versatile, and is so pretty in mint. I know you will love it! I love the texture of python on all their bags, and so many colors and styles to choose from. These are some of my absolute favorites of their line, and I guarantee you that I would get a lot of miles out of these bags. The teddy tote would be such a great carry on when traveling with a wide open top for easy access as you go thru boarding and checkin. The cross body is so unique with the middle zipper don't you agree? And what savvy business woman doesn't need a hot pink card business card case? Gigi New York is located in Melville, New York and is a family owned and operated company. If you haven't checked out the vast selection of products, you can see them all here! So are you ready to enter? Just follow the instructions in the rafflecopter form, and good luck! I love the black barrel bag! Thanks, Lisa! What a great giveaway! I love that aqua/natural bag, so pretty! My favorite item is the Jessie Tote in embossed python in mint. I absolutely love the Iphone wristlet in mint! Such a great giveaway! I love Gigi NY handbags! 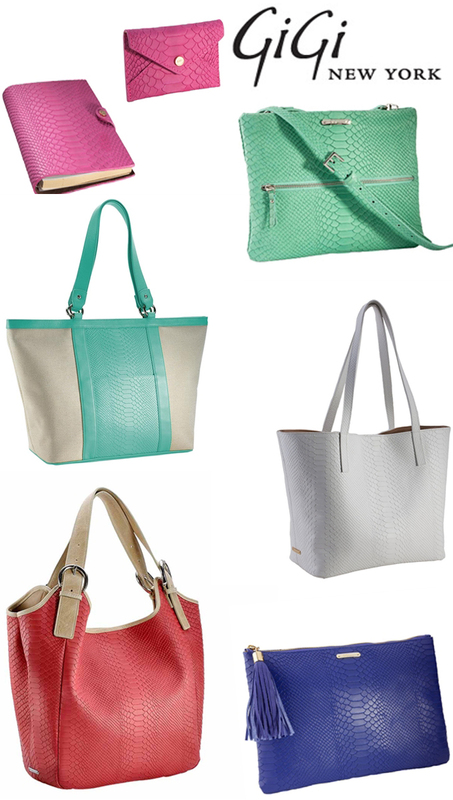 My favorite is the Mint Jessie Tote - Embossed Python! For me its a toss up between the Teddy Tote in Mint and the Uber clutch in Indigo! They are both so beautiful! Love the mint cross body! Her bags are so gorgeous!! Love the black cross body! Can be worn with a ton of stuff! ORANGE JESSIE TOTE is my fav!